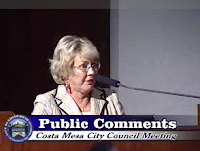 A BUBBLING CAULDRON: Ladies and Gentlemen, Your "New" Costa Mesa City Council! 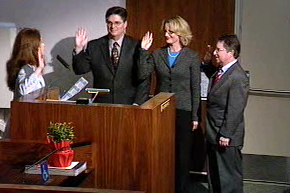 Ladies and Gentlemen, Your "New" Costa Mesa City Council! Last night, after bidding departing council member Linda Dixon a fond adieu with a nice video tribute prepared by the city staff and accolades from Wendy Leece and Katrina Foley, the new City Council was sworn in and seated on the dais. Congratulations to Katrina, Eric Bever and Gary Monahan. It will come as no surprise that Katrina Foley WAS NOT elected as Mayor. No chance of that happening with this council. At least they allowed her to remain on the dais and didn't force her to sit in the audience! 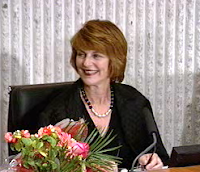 Allan Mansoor was nominated by old newcomer Gary Monahan as Mayor, which was seconded by Wendy Leece. Mansoor was unanimously elected to a term which should take him to the end of tenure on the council in 2010. Mansoor then nominated Wendy Leece as Mayor Pro Tempore (seconded by Monahan after a pregnant pause) and she was also elected unanimously. So, we're right back where we were a couple years ago, with Wendy stuck to Mansoor's hip like a barnacle. And, we're all set up again for the old "dais shuffle" that Mansoor and Bever pulled a year ago when they swapped seats. Watch for Mansoor to give up his seat to Wendy again in about a year so she can run for re-election as "Mayor" - a huge leg up on the competition. Ah, the political games we play in good old Costa Mesa. 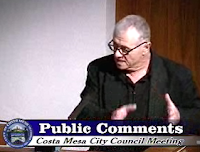 One amusing sidebar did occur during public comments. A local activist - Mr. U. Know-Who - seemed to almost blow a gasket as he instructed the council on their responsibilities regarding the two school foundations. He accused the foundations of violating their agreements with the city and violating the law. I thought the poor, deluded man was going to stroke out right there at the speaker's podium. Bever's campai gn chairperson, the perky Judi Berry, instructed the council that they need to think about cutting salaries or staff to balance the budget and included an illegible graph as part of her presentation. She was followed to the podium by her husband, Mike, who continued the script with his own rant. What a team! I'm apprehensive about what to expect from this council. They've been described in some venu es as the most conservative council in recent memory. I think that's probably accurate. I suspect we'll see some moves to restrict individual freedoms from this group and will almost certainly result in further legal challenges as the next couple years pass. History shows us how they vote on many issues. Mansoor and Leece, in particular, seem determined to overlay their extreme right-wing views on our community. This does not bode well for our city, and the Latino population and those entities that provide a support system for them, in particular. This group is still smarting from the whole "Benito Acosta" affair (Monahan mentioned it during campaign forums) and will likely look for opportunities to strike back. We now have a month to gather our thoughts, celebrate the holidays and try to figure out just what to do with the budget come January. Comments from residents last night implied that everything should be on the table - even staff cuts. Funny, I didn't hear any of the council members volunteer to work for a dollar a year until the crisis is over - maybe that will come in January (he says, stifling a snicker).